Off the beaten path, but with excellent rooms and facilities, very friendly staff. Nice pool and workout facilities. We had an excellent stay. The hotel was very nice. Fresh fruit at check in and amenities in room. Window over poor were dirty. Very clean, rooms not spacious but comfortable. On site dining for family expensive but other eating options within walking distance or very short drive. Pool area very nice. Attendant on duty was helpful and friendly. Parking safe and free, kids enjoyed the pool, easy access to freeway. No alarms sounded for tornado warning! We knew because we were watching TV. 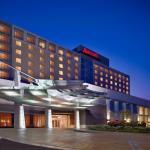 The 252-room Marriott Louisville is a 15-minute drive from downtown Louisville and provides affordable accommodation equally suited to the business or leisure traveler. Items included with the room rate at this 10-story, non-smoking hotel are local telephone calls, a morning newspaper, parking and coffee available in the lobby 24/7. 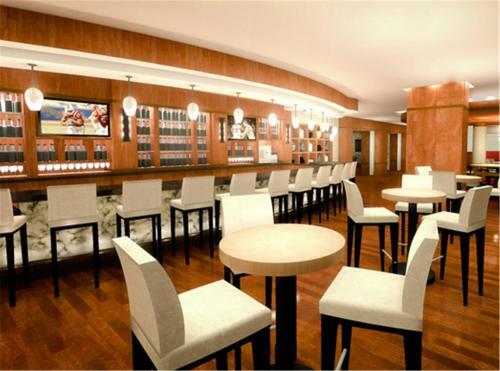 There are 12 meeting rooms available for social or business functions. The largest, the Embassy Ballroom, can accommodate 600 guests. Area landmarks and attractions include five golf courses, Kentucky Fair and Exposition Center, the Louisville Zoo, Waterfront Park, Louisville Slugger Museum, Louisville Glassworks, the Muhammad Ali Center, the Jim Bean Distillery and Churchill Downs, home of the Kentucky Derby. All the guestrooms have a work desk with high-speed Internet access, television with cable movie and news channels, pay-per-view movies, wet bar, pullout sofa bed, alarm clock, tea and coffee making facilities, iron and ironing board, hairdryer and two-line telephone with voicemail and speakerphone. The on-site Bistro 19 serves breakfast, lunch and dinner and room service is available from 6.30 until 11pm. Restaurants nearby include a Macaroni Grill, OCharleys and a TFI Fridays. The 24-hour front desk has safe deposit boxes. Other amenities include a concierge desk, indoor swimming pool, whirlpool, fitness center, full service business center, laundry, valet dry-cleaning, vending machines and a gift shop and newsstand. 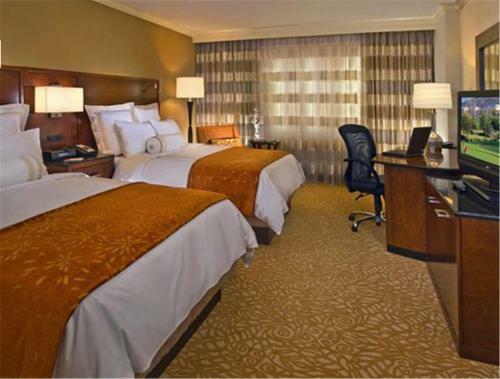 This hotel gets good reviews for its reasonable prices, friendly and efficient service and quiet location near the Bluegrass Industrial Park. Sadly there were some complaints that the property is need of updating. Despite this many clients said they would stay at this hotel on future visits to Louisville and would recommend the property to others.